A Ctenophore gets its name from the Greek cteno which means comb, and phoros which means carry, and translates to "comb-carrier". Ctenophores are small marine predatory organisms that are vaguely reminiscent of jellyfish. They constitute a large part of the plankton biomass of the planet's oceans. Their name comes from the comb-structure of the locomotive cilia placed in almost symmetrical rows. Unlike jellyfish, Ctenophores do not have cnidocytes, which are stinging cells, but they do have colloblasts, which are sticky cells. The most common Ctenophores are the sea gooseberry and the Venus' girdle. All species are hermaphroditic. Although Ctenophores allow themselves to drift on the ocean surface with marine currents, they can also swim. They move using the comb rows of locomotive cilia, located along their sides. Their bodies are translucent and look like iridescent gelatin. Some produce light by bioluminescence, others reflect and diffuse light in the form of coloured flashes when they move. They are found in all the world's oceans up to a depth of 4,000 metres, and in sea water as well as the brackish water of estuaries. They are particularly abundant in the tropics and near the two poles. General Ctenophore morphology can have several different shapes: ovoid, ribbon, pear or bell shaped. Ctenophores often have about eight rows of beating cilia located at the base of their body and, are used as a mean of propulsion. The majority of these species have two long tentacles, which are retracted into a sheath when they swims. Tentacles are only used for hunting. Ctenophores have a fantastic capacity for regeneration, for even when seriously damaged, the organism can fully rebuild itself, and some organs, such as the statocysts, can regenerate themselves even after having been completely destroyed. Ctenophores have a biradial morphology with a few asymmetrical structures that can be found in the pores, anuses, comb rows used for swimming and statocysts, which are their balance organs. Their balance organs consist of calcified cells, which are balanced on the flagella and exert pressure, depending on the organism's position. 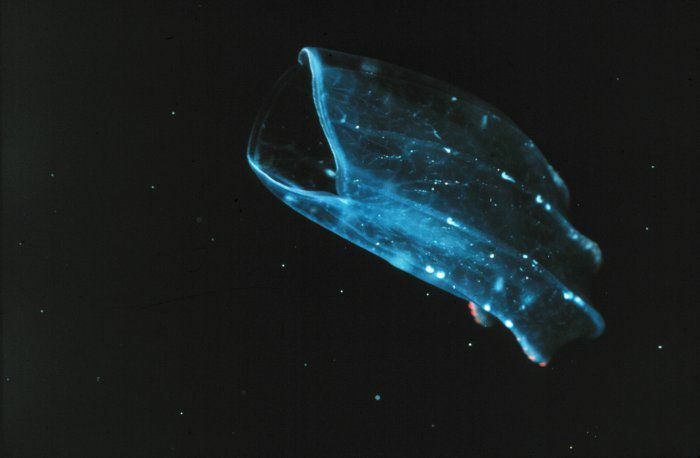 This impulsion is used by the Ctenophore to asses its position in space. Sensory stimulation transmitted to the ectoderm allows the Ctenophore to re-establish its horizontal balance by activating its locomotive cilia. Although they are fearsome predators, Ctenophores are certainly the most graceful creatures of the oceans. Their strange shapes, their extreme fragility and the diversity of their colours created by the iridescent flashes accenting their elegant movements, make them look like marine extraterrestrials. James Cameron was probably inspired by their morphology and the fluidity of their movements when producing his excellent film, Abyss.